Before 2018 came to a close, Slayer announced they would headline Heavy Montreal, marking their last-ever show in Quebec. Now, it appears the band have inadvertently revealed the rest of the fest's 2019 lineup. 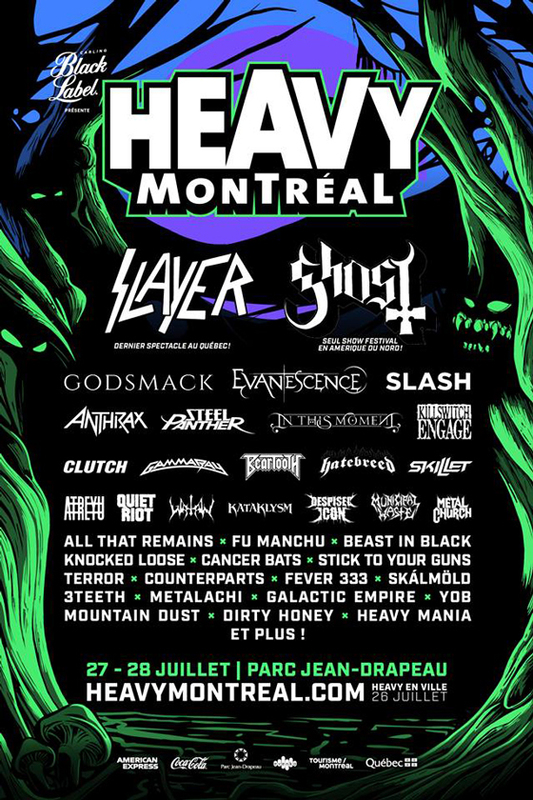 A now-deleted post from Slayer's official Facebook page came accompanied by a complete lineup poster, revealing a number of other headliners and undercard acts set to appear at Heavy Montreal this year. You can find the post archived below. As of press time, however, the organizers of Heavy Montreal have not confirmed the validity of Slayer's post or made any sort of announcement on their end. Joining Slayer at the top of the bill are Swedish metallers Ghost, followed closely by Godsmack, Evanescence, Slash, Anthrax, Steel Panther, In This Moment, Killswitch Engage, Clutch, Gamma Ray, Beartooth, Hatebreed, Skillet, Atreyu, Quiet Riot, Watain, Kataklysm, Despised Icon, Municipal Waste and Metal Church. Other names appearing on the poster include All That Remains, Fu Manchu, Beast in Black, Knocked Loose, Cancer Bats, Stick to Your Guns, Terror, Counterparts, the Fever 333 and more. Heavy Montreal will return to the city's Parc Jean-Drapeau the weekend of July 27 and 28. Festival passes are currently on sale through the event's official website. Anthrax and Killswitch Engage Join Forces for "The Killthrax Tour"
Killswitch Engage "Alone I Stand"